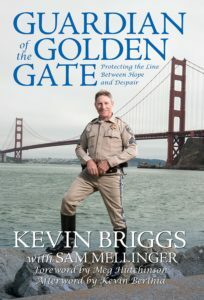 Kevin Briggs spent most of his 23 year career as a California Highway Patrol officer patrolling the Golden Gate Bridge and surrounding areas. The Golden Gate Bridge is one of the world’s most “popular” locations for persons committing suicide and during his career Kevin talked several hundred persons out of making that irreversible mistake. He is the author of the book “Guardian of the Golden Gate Bridge; Protecting the Line Between Hope and Despair”. Suicide is the 10th leading cause of death in the US. Help is available! Call 1-800 273-TALK. We discuss two persons he interacted with on the bridge; one who jumped (Jason Garber) and one who didn’t (Kevin Berthea). Kevin also shares the significant “collateral damage” that a suicide can cause among family members and friends. Kevin shares the indicators and potential triggers to look for; hopelessness & helplessness, loss of interest in appearance, changing sleep patterns and significant life losses like a death, divorce or financial problems. He also walks us through his RELEASE MODEL for talking with someone considering suicide. Broaching the subject with another person can be uncomfortable but must be done. Kevin recommends doing so someplace private and employing the 80/20 rule; listen more than you talk. Kevin Briggs doesn’t like being called the Guardian of the Golden Gate Bridge but he accepts it because it grants him the platform to help others. TAKEAWAY: “There are many guardians of many Golden Gates. Your HOUSE could be a Golden Gate where YOU can make a difference in someone’s life.